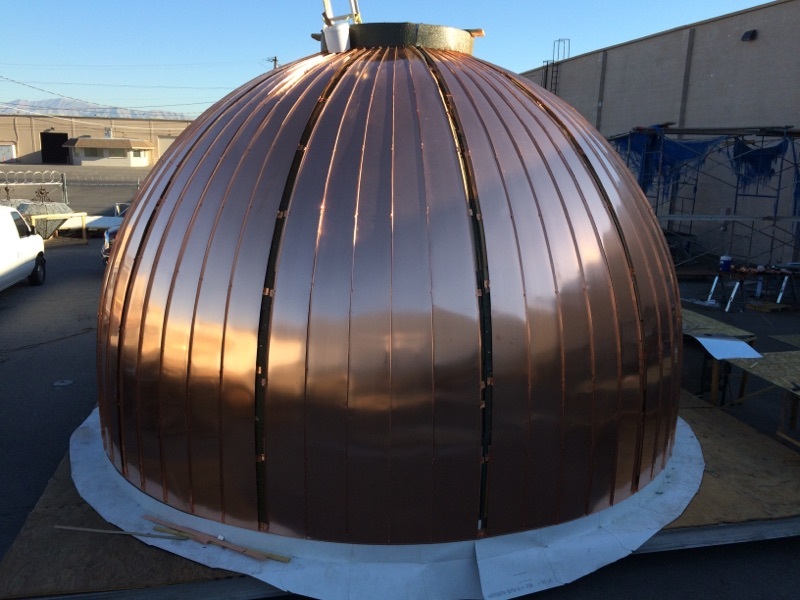 Prestige Roofing has delivered and mounted the new cupola, an inspired copper dome design, commissioned to grace the roof of the new Nevada Supreme Court building in downtown Las Vegas. The classic design of this new state building that will serve the people of Nevada’s as its highest court is perfectly complemented by the cupola whose classic look recreates the dignity of famous buildings worldwide. The Prestige team is proud to have participated in building and delivering the dome. 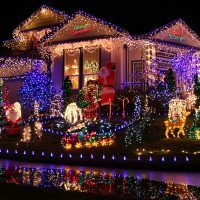 We’d like to share some of the images as it happened. The dome project began with building the underlying structure and cutting, shaping and installing the copper on the dome’s steel frame. The dome was designed and built so that it could be dismantled in sections for transport to the installation site. 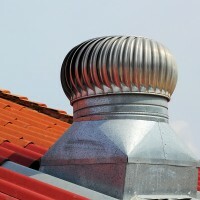 As a final step in the construction process, the brilliant new copper was aged to give it the classic patina that beautifies copper domes and copper roofs atop structures around the world. The classic green patina was achieved with an acid mixture that accelerates the normal oxidation process that results in the changing coloration. 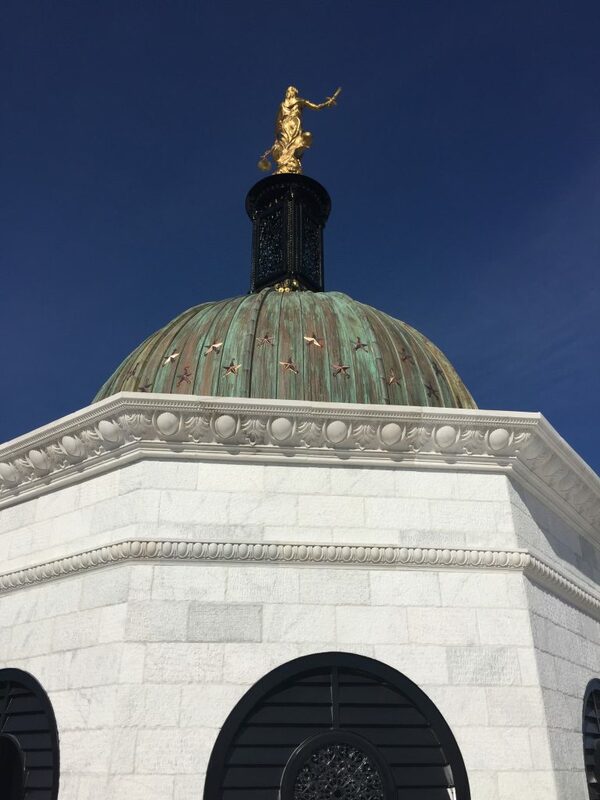 Left to itself in the dry desert air, the dome would have turned a “dirty penny” brown patina, while the more attractive and recognized aged copper green patina, which needs moisture from the surrounding air to form, happens most quickly in coastal areas. With a little help from us, the dome was able to achieve that natural effect and present itself from the start in its most beautiful colors. Once the dome, or cupola, was complete and ready to go, it was disassembled in quarters for easy transport. Fully complete, the dome itself weighs about 7,200 lbs and is 14 ft tall with a diameter of 20 ft. The circumference is 63 ft, so transporting it across town was made easier by sectioning the large structure. The sections were loaded and transported from our facility in North Las Vegas to the downtown Las Vegas construction site of the now nearly complete Nevada State Supreme Court building. 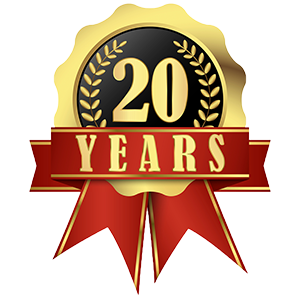 Prestige had already completed the flat membrane roof on top of the building where the cupola would be installed. 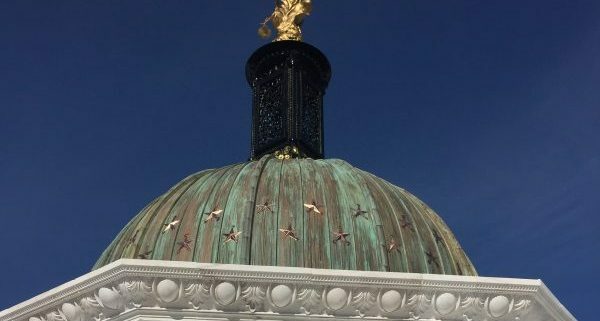 Each quarter of the copper dome was separately hoisted by crane onto the lantern, or elevated section of the roof, which serves to raise up the decorative cupola and spire for better visibility from below. The four sections of the cupola were then reconnected to reform the entire structure in its new home. 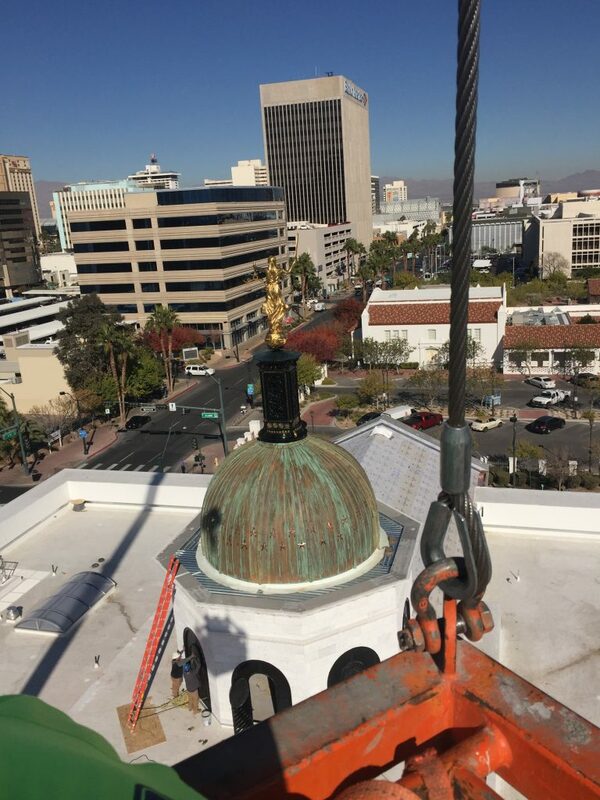 Once the cupola was in place and secured, we were ready to install the decorative spire and statue of Lady Justice to cap off the beautiful structure. Using a crane and lift, we secured those finishing touches place. 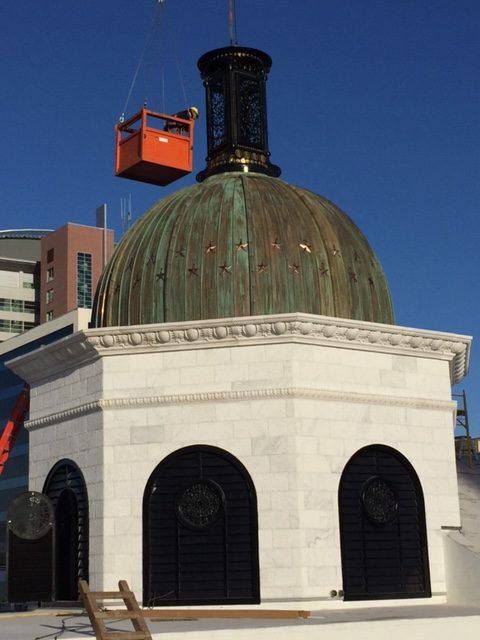 The entire copper cupola project took several months and put our sheet metal talents, experience with roof dome structures, and our copper roofing expertise to the test for a one-of-a-kind project. We’re very pleased to have had the opportunity to participate in helping to write a new chapter in Nevada history. 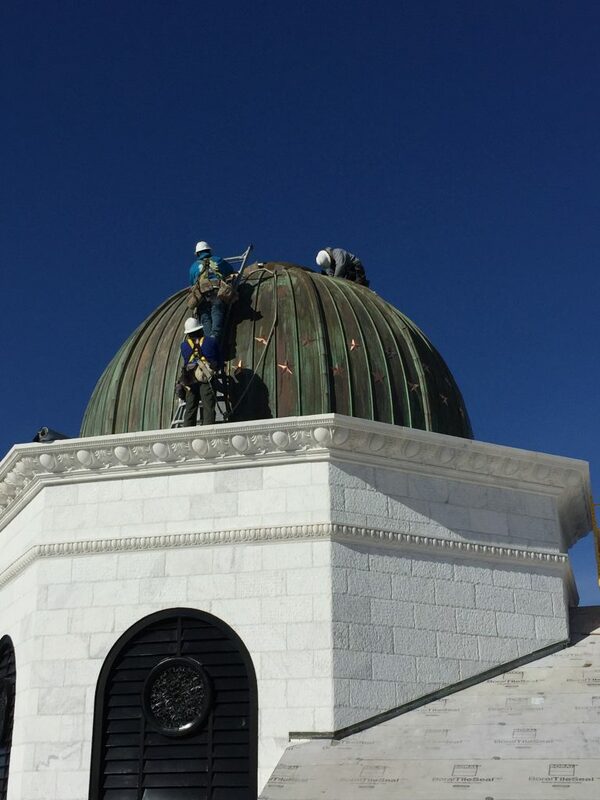 For more pictures from the installation and to see a photo of the entire finished cupola, visit our Nevada Supreme Court Cupola Dome project page. 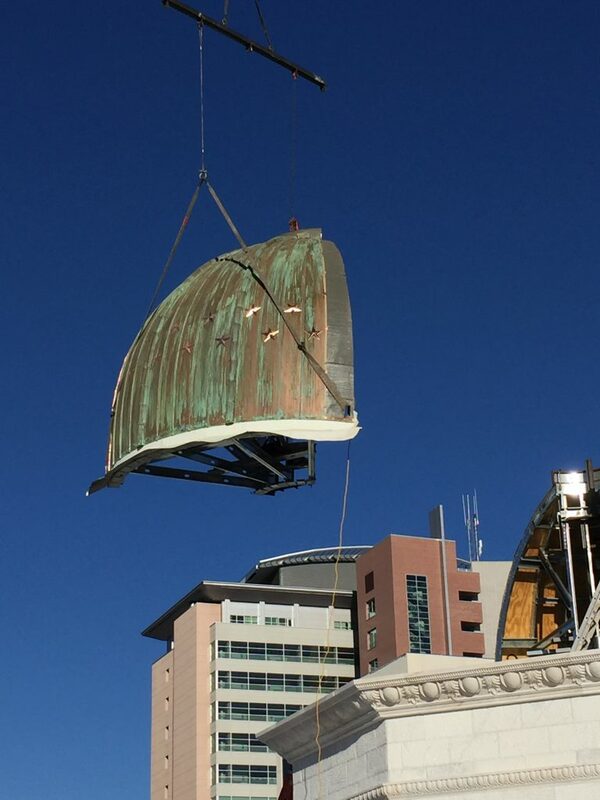 If you have any questions about the cupola project, a monument that now belongs to all Nevadans, contact us and we’ll be happy to answer them.